Well, that was an interesting one and gave us food for thought on a number of issues. 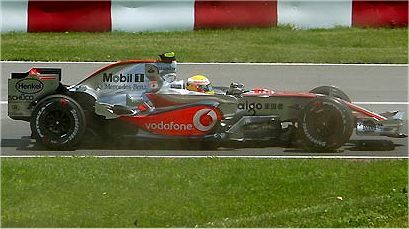 After Alonso's bid for the lead failed at the first corner, Hamilton duly won at a canter. We can talk about good luck in the timing of his pit stops but the rookie did not put a foot wrong all afternoon and deserved his win as a result. Nick Heidfeld's second place is not being seen as significant by most, perhaps because the order behind him was subject to constant re-shuffle by the safety car. But Nick had as trouble-free a race as Hamilton's and stayed with him all the way. It looks to me as though the BMW has caught and passed the Ferraris and is getting close to McLaren pace now. This might save us from a McLaren walk-over in the second half of the season. With Ferrari running out of steam, it is our best hope, anyway. And remember how Jenson Button scored more points than anyone else in the last quarter of the 2006 season - seems a world away now, I know. Looking further down the order, it was good to see not only midfield teams scoring points, but the bad-luck drivers too. Wurz showed us that slow and steady gets third place sometimes and he also gave some scale to the other drivers on the podium, looking like a giant next to Hamilton and Heidfeld. He's a friendly giant, however, judging from his honest comments after qualifying and that goofy grin when things go well. Kovalainen also was due some good fortune after terrible practice and qualifying sessions. But Sato nearly stole the show with his pass on Alonso - and it did not matter that he had the tire advantage at the time. For a Super Aguri to pass a McLaren is news, whatever the circumstances. But the star of the GP was the new safety car rule - four moments on stage and each one a blockbuster. Never mind the re-shuffling in the order it caused; safety cars always do that to some extent. It was the penalties handed out to Alonso and Rosberg for being unlucky enough to have insufficient fuel to make it around one more lap that brought attention to the weakness of the new rule. Any regulation that penalizes those who are scheduled to stop on what turns out to be a safety car lap has got to be wrong, surely. The luck of the draw? No, that's more like turning the race into a lottery. The disqualification of Massa and Fisichella for leaving the pits under a red light is easier to swallow. The drivers will keep a close eye on that in future, no doubt. And Kubica's accident, although horrific, demonstrated how strong the cars are these days - a rare plus point for the FIA who keep making the impact test harder to pass. So, talking points aplenty but, to echo Keith Collantine at F1 Fanatic, was it a race or a crash fest? It's a hard one to answer, there being no doubt that the multitude of incidents made a race to remember but the side-lining of so many of the usual stars devalued the finishing positions to an extent at least. On balance, I think that F1 needs the occasional race like this to remind us that it can still entertain and fascinate. After the processions we witnessed in the preceding races, Montreal 2007 was an extravaganza. Full marks to the marbles for taking so much of the blame and to an errant marmot too (it wasn't a beaver, Anthony!). Testing, testing, 1, 2, 3, testing. I totally agree with you on all but one point. You say that the value of the race was a little tainted by the fact that the usual front runners, such as Alonso and Massa were taken out of the race by non-racing incidents.... In my opinion Alonso lost more then 10 seconds by his own poor driving. Massa was pissed about the new rule that ruined his race, but the 2 youngsters were experienced enough to stop. So I hate to think that the Kovi, Hielfeld and most of all Sato could have any credit taken away from amazing drives because the ones that are expected to win made stupid mistakes. To note, last years Honda seems to be making some pretty substantial updates. At least if the factory team went back to 06 spec that would be somewhat competitive. I wonder what it is about this new Honda chassis that is apparently worth continuing to develop instead of reverting back to a known winner in the 06 version. I guess its part pride in showing they didn't waste that much time and money on a new car that just doesn't work. I would assume that the 08 spec would be much different due to the lack of TC. My point is really that, regardless of the reasons for the disappearance of the stars, their absence was the reason others were able to grab some points. Had Alonso and Rosberg not been given ten second penalties and Massa and Fisichella allowed to continue, they would have occupied most of the top eight spots. Races like this do happen occasionally and we get some unusual names appearing in the points as a result - but everyone knows it's because the circumstances put some of the top runners out and that it will be back to business as usual in the next one. I think that Heidfeld was going to take second whatever happened in the race - nothing devalued about his points. But Kovalainen got lucky, as did Wurz - their strategies happened to fit the timing of the safety car periods very well. The same applies to Sato to some extent but he showed great determination in passing Ralf and Alonso at the end - all credit to him. The Honda dilemma is something that all teams meet sooner or later: they've worked hard and paid good money to design and build the new chassis, incorporating all the lessons they'd gathered from the previous season, then they get it on the track and the darn thing doesn't work as it's supposed to. Decisions have to be made then. Do you try to find out why it doesn't work or give up on it early and go back to the old car? Most teams opt to keep trying with the new one in the hope of finding out what they've done wrong. I guess the theory is that, if they can find that out, they won't make the same mistake with the next design. Once you've found the problem, you again have a decision to make. Do you try to fix it and persevere with the current car or stop work on it and put the lessons learned into next year's car? Red Bull did that with last year's car - gave up on development and put all their effort into the 2007 Newey design. As a result, they had some pretty poor results that season but are beginning to reap the benefits now. As for what differences in design the banning of TC will make, I don't think they'll be very noticeable. So much of the car is dictated by aerodynamics these days that a mechanical alteration like TC/no TC will only affect the drivers. So the cars should look very similar to this year's but we might see one or two drivers doing better or worse than they have been. All that above is a lot of reading for my old eyes and I really think the safety car and penalties have to be addressed. This new safety car business and open/closed pits is drawn from NASCAR. (The pinnacle of motorsport dumbing down to NASCAR standards.) There is something wrong penalizing Alonso and Rosberg just because they were entering the pits as the safety car was leaving, "Luck of the draw" is not a suitable response. Penalizing Massa and Fisi for not obeying the red light ....... that's hard to defend, but I'd put Charlie Whiting on the carpet to explain why the pit entrance was OPEN but the pit exit was CLOSED, one couldn't get out if one entered. Queing up cars in pit lane while the rest of the race goes by behind the safety car is not right! The real high points of this debacle ....... Kubica proved the security of a modern chassis and Sato passed cars, something not seen all season. A personal pat on the back for Heidfeld, Wurz and Kovalainen. It's good to see some new names up front . I knew where the FIA got the idea for the rule change, Number 38, although it seems strange that later they would go to extreme lengths to avoid copying Champ Cars' red stripe to indicate soft tires. Maybe they work the lights more sensibly in NASCAR but the rule just looks wrong in F1 - and to "get used to it" isn't really the answer. I feel that it should be rescinded and the rules returned to how they were. Yes, it was good to see some new names in the points - and I hope Heidfeld can win a few races this year. Good to see you're back in blogging action. Can't decide on my answer to Keith Collantine's question. Sure it was a bit of a crashfest, and the result was never really in doubt, but there was an awful lot of overtaking (anyone else think it significant that the Ferraris passed nobody though - perhaps adding weight to suggestions that they really don't work in traffic). The main good point, though, was that Kubica was able to survive a monstrous accident with only superficial injuries. It's good to be back, Patrick. And Keith's question is a difficult one indeed. Yes, it was good to see so much action and drama but would we like to see all the GPs like that? It would make the championship a matter of luck, I think. I agree about Kubica - and hear today that he is fully expecting to race in the USGP! I like your observation of the Green in Red out in the pits.... Never would have thought of that but it really does make sense. The pit out is actually shorter then going around the start/finish-first so you actually have an advantage if the other cars are behind the pace car. That being said Nascar rules work for Nascar not F1. Why wouldn't they just use the same theory for Alonso, if he needed to pit that badly then he should be able to, just red light the exit until the field goes by so he doesn't get an advantage by all the cars moving at a reduced speed behind the pace car. Or alternatively, give him the 10 sec penalty while pitting extending his stop. By having to go back in he lost about 30 seconds and that was after everyone was moving at top speed again, making for an even larger margin. But like anything else, the rules are not hidden away and kept in a safe somewhere, they are for everyone to see, theres no reason to disobey them. You knew coming into here that there was going to be cautions so why didn't anyone think to load up on fuel and stick it out other then Wurtz and Davidson? Better yet come in under the first caution put on the option tires, go around once and get them off again and run the full race (just about) on the prime tire, eventually everyone else would have to pit again and with the help of the cautions you should be able to stay close enough to get in front. Sorry for the eye workout Number 38! In Canada, a "marmot" is called a "ground hog", as in "Ground Hog Day". I am from Malawi and too poorly know English, tell me right I wrote the following sentence: "I heard that there are clocks that are super accurate." Thank you very much :-(. Harel.